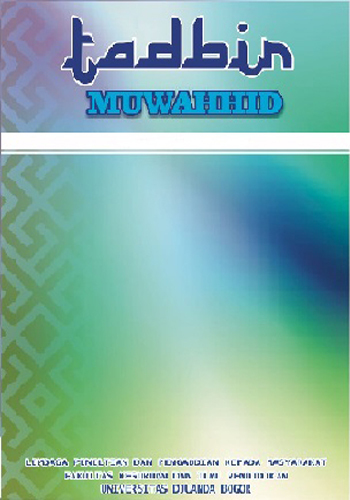 Tadbir Muwahhid Journal is a scientific journal covering aspects of Islamic Education Management and Tauhid-Based Management published twice in a year on every April and October with the submission process of manuscript is open throughout the year. Tadbir Muwahhid began to be published in 2017 as a refinement of Journal of Ta'Dibi: Jurnal Pendidikan FKIP UNIDA with P-ISSN 2442-4994 initiated by Faculty of Teacher Training and Education Djuanda University of Bogor. In 2017, the journal published with P-ISSN: 2579-4876 and E-ISSN: 2579 - 3470 in accordance with the policy of LIPI. Since 2017, Tadbir Muwahhid Journal has been using Open Journal System requiring all writers to register in advance before they are allowed to upload the manuscript they write online. Afterwards, the editors, peer reviewers, and writers can monitor the manuscript processing. All submitted manuscripts will go through the double-blind peer review and editorial review before being granted with acceptance for publication. Designed as a medium of information and scientific knowledge, Tadbir Muwahhid publishes research articles, in the area of Islamic studies, education and institutional management, curriculum management and learning resources, facilities and finance management, Islamic education psychology, education management information systems and technology, Islamic education leadership, counseling management, Islamic education planning, Islamic education evaluation as well as with their development through interdisciplinary and multidisciplinary approach.